The greenhouse this morning really feels like spring with February sunshine warming all sections and vents opening to let in lovely fresh air. The greenhouse is at its best from the end of February to April with most of our cool growing species flowering towards the end of dry season in their natural habitat which coincides with our spring..
Joe and Ben here with information about Dendrobium moniliforme, one of our cool growing Japanese species. 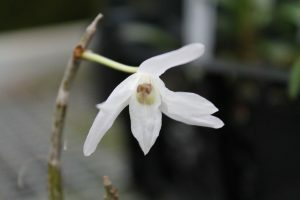 This is a small growing Dendrobium with pseudobulbs up to 10cm long and long lasting fragrant flowers produced in the spring. It is native to China and Korea as well as Japan. We keep the species in Cool Asia where it gets a very wet summer but a dryer winter when it sheds some of its leaves and produces its flowers. In Japan where it is known as Sekkoku or Chouseiran this species has a long history of cultivation and many clones including variegated ones have been selected and propagated.